Saturday morning, I woke up early. My wife had to tend to a client at her office and I knew I had a lot of office work and school work to complete along with a long to do list of chores. My plan for the morning was to shower, grab some breakfast somewhere and crank out some work on my laptop. However, as I was getting ready to leave the house, the morning news caught my attention. There was a morning show chef, Stacy Fawcett, who was cooking up a breakfast that caught my attention: Italian baked eggs. 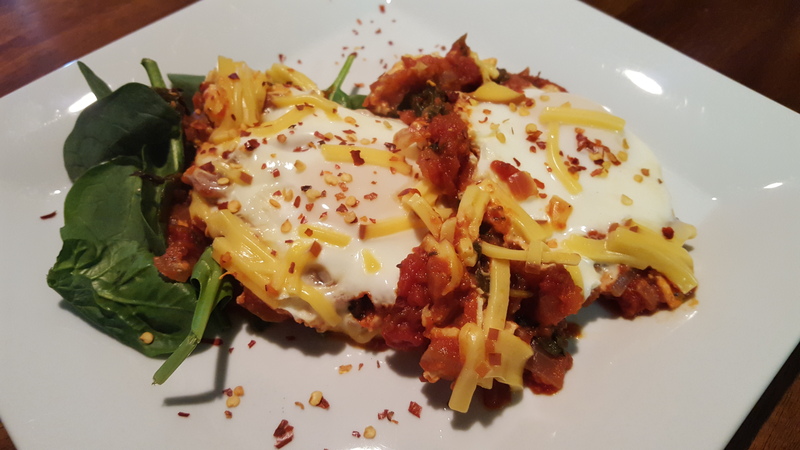 As she lined up the ingredients, I realized that I had almost everything the recipe called for, all of which was nearing its expiration: the last of the week’s spinach, a few eggs, a can of crushed tomatoes nearing its expiration and a stray pair of cheese slices. From the television, I darted into the kitchen where I donned a robe, took to the stove and emulated Chef Fawcett’s dish to the best of my ability. The results were amazing, but I didn’t stop there. So full of energy, creativity and inspiration, I wanted to share with the world of social media how awesome the dish was, how easy it was to make and how a local morning television show could really shape up the rest of my day. But, knowing me, a still image wouldn’t do the trick, I needed something more. Over the last few weeks, my wife keeps showing me these animated GIF recipes which show how easy it is to make the referenced dish. I always wondered how difficult it would be to make one of these, so as I was cooking this morning, I paused to photograph each step with my phone’s camera. The images weren’t the best, but the idea was there. Now how would I stitch all of these together? Well, that’s something I din’t know. So, I did what any self-respecting do-it-yourselfer would do, and I took to Google. It’s amazing how many people have created content teaching others how to do things, just out of the kindness of their heart (or to make ad revenue from the page impressions…but either way, it’s out there). After finding an article on how to make an animated GIF in Photoshop, I downloaded my images from Google Photos, stitched them together with some text and created the instructions below. It’s not something you’ll likely see on Food & Wine anytime soon, but it was fun putting it together. I learned something new, I exercised my creative passion and I feel energized to attack the rest of the weekend knowing that I created something that I couldn’t create before. There’s something to be said about learning a skill or technique, applying it and sharing the results with the world in real time that is so satisfying. By day, we’re bound by the things we do to make a living. In my observations, it isn’t feasible for all of us to profit from our passions and maintain our current lifestyles. I caution you about being defined by what you do for a living, and instead live for what you’re passionate about. We all need a vocation of some sort to let us enjoy the things we are passionate about, but makes those passions your life and let people see you for who you are and what you love doing. So, with that, I saved the money on eating breakfast out. I was able to use a few things in my cupboard before throwing them away. I was able to burn some creative calories. I cleaned the kitchen, did all of the dishes and gave myself the inertia I need to plow through the rest of the day. Inspiration is a powerful thing.